I played Woodle Tree Adventures so that you don’t have to. 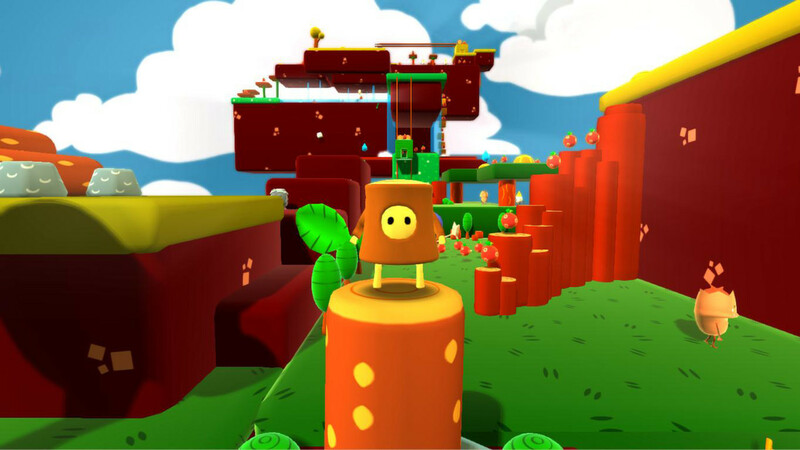 This 3D platformer looks endearing enough, and I, like I’m sure many would be, was drawn in by the game’s adorable protagonist and the bold, primary coloured worlds that you must explore. But, beneath that charming exterior lies an unmemorable experience that frustrates far more than it ever manages to entertain. It starts harmlessly enough, as a moustachioed tree, that’s no doubt a humble nod to the sagely Great Deku Tree, explains that you have been born from his roots. Your character, which is a small tree stump that has miraculously sprouted arms and legs, has been given life for a purpose and must collect fairy’s tears to restore water to the parched land. Even this simple premise is struck with an immediate problem, as you spot a flowing waterfall directly behind the fatherly tree in the opening cutscene. Perhaps he was planted facing the wrong direction. From here, you’re then warped to a house that has been painstakingly constructed for you and acts as the hub world for your adventures. And, inside the house, you can find two gifts that have been left to help you in your quest. These are a rucksack, in which you can stuff the countless berries that lie scattered in each world, and a magic leaf, that you can swing at your enemies and must be used to slap the magical globes that appear in your house in order to travel to the worlds that they depict. Magic leaf swung, the worlds that you find yourself in are as colourful, confusing, and mediocre as one another – to the point that only their themes will help you to tell them apart. And those, too, have been plucked from a well-thumbed copy of the platformer playbook. You’ll find yourself underwater, on a beach, leaping on top of a honeycomb, and sliding around an icy snowscape, as you hunt down the three fairy’s tears that you need to find in each world before you can leave and move on to the next. You are told early on that you need to eat the berries to survive, but, as I soon discovered, taking any damage (or tumbling to your doom) will simply return you to a spawn point, and one that is usually right back at the start of the level. The magic leaf will help you keep your enemies at bay, especially once you have amassed enough berries to unlock the leaf’s metallic-coloured upgrades that will let you unleash gusts of wind as ranged attacks. But, the problem is that it’s hard to tell which characters are friendly from those that are not, most having beaming smiles to simply lure you into a false sense of security. That only sees you resort to swinging the magic leaf at every enemy in sight, and soon makes a cheery world feel like one that’s constantly hostile for no particular reason. That unending wariness is only a minor frustration compared to the fixed camera angle, that means every jump that you make feels like a leap of faith. The developer has apparently made an effort to improve it for this Nintendo Switch port, but it’s hard to tell. The camera quickly becomes an Achilles heel to the experience, the lack of direct control leading to misjudged jumps, unnecessary deaths, and having to begrudgingly retrace your steps back to wherever you fell. That’s not to mention the times when it would unintentionally lock in place and I would be left leaping around somewhere off-screen, which is a bug that has remained unaddressed for some time now. The issues that Woodle Tree Adventures runs into are basic ones, but they compound each other so much that it was a test of endurance to see it through to its unrewarding conclusion. Throw in a lethargic soundtrack that feels completely at odds with the game, and it soon becomes hard not to overlook how disjointed and sub-par it all is. It needed a second opinion that would have pointed out how incomplete and half-finished it is, which is even more troubling when you come to realise that it was released on Steam four years ago and it’s still this bad. Woodle Tree Adventures has potential but fails to ever realise any of it. The paint-by-numbers approach that has been taken to make this 3D platformer results in a game that feels more like a proof of concept or prototype rather than something that you would happily pay for. The greatest insult is that it had promised to “take you back to the good old days” when we were running around collecting Jigsaw Pieces in Banjo-Kazooie and Power Stars in Super Mario 64. And that couldn’t be further from the truth.